Nissan’s Titan has been given a tough row to hoe. One of the few strongholds of American manufacturers is in the full-size pickup arena, where buyers overwhelmingly choose American makes. Even mighty Toyota struggles to sell Tundras, with less-mighty Nissan only moving a relative handful of Titans every year. Kind of makes you wonder why they bother. Running boards helped with the tall step-up into the interior, and lights underneath cast a full-length glow on the ground at night. But in reality, the Titan is a pretty darn good pickup, even if it doesn’t have a lot “special” to boast about. Despite having been redesigned for 2016, there’s nothing high-tech about the Titan’s powertrain: no turbocharged engines or cylinder deactivation, no 8- or 10-speed transmissions, not even available full-time 4WD. 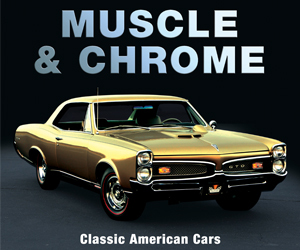 But the 5.6-liter V8 puts out a healthy 390 horsepower, and in combination with the 7-speed automatic transmission, returned a laudable 18.4 mpg in mostly highway driving and averaged an equally laudable 0-60 time of less than 6.8 seconds – both figures being right there with the best. Furthermore, the Titan gets a good full-throttle jump off the line and responds quickly and strongly when the throttle is stabbed at speed, and it’s surprisingly serene in freeway cruising. It also fared quite well over our rough Chicago roads; not up to the smoothness of the Ram 1500, but then, nothing else in this class is. As common on big pickups, maneuverability isn’t the best, and the steering wheel seemed a bit slow to return to “straight” after taking a sharp corner – though again, that’s kind of par for the course. Only hard door tops marred the nice selection of cabin materials. The control layout is quite sensible, though the radio tuning knob and some buttons are a far reach to the right. As with most full-size 4x4s, it’s a bit of a hop up into the interior, aided here by running boards that incorporated full-length ground lighting. 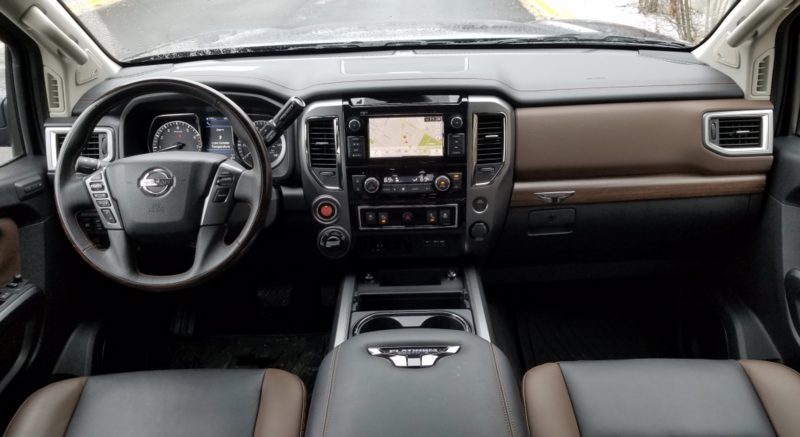 Once inside, you’ll notice the otherwise-ritzy two-tone leather with wood trim of our top-line Platinum Reserve tester being let down with hard plastic door tops, but the rest looks quite upscale. Tall front-seaters should have sufficient headroom but may find legroom surprisingly tight, while those in back should have plenty of both, with a nearly flat floor allowing for decent three-across seating. The driver seat included a tilt cushion and adjustable lumbar support – both comfort pluses – and quite notably, the Titan had a power tilt/telescopic steering wheel whose position could be kept in memory along with the driver seat and mirror settings – a real convenience if two people share the vehicle. Back-seaters were made to feel at home with heated seat cushions and 12-volt/2 USB/120-volt AC (household current) plugs. There’s plenty of room in back for passengers, and even three adults can squeeze in. Raising the seat cushions reveals a fold-out platform with hidden storage underneath. Visibility is not a strong suit. It’s restricted to the front corners and sides by wide roof pillars, and to the rear corners by tall headrests. Fortunately, our tester included a 360-degree camera system that could provide front and side views at the touch of a dashboard button, though that button was far to the right, out of easy reach. Also out of easy reach were some of the audio controls – most notably the tuning knob – but other controls were handier. Cabin storage was shorted only by a smallish glovebox, as the console box was very spacious (the norm for large pickups) with a removable tray and 12-volt plug, there was a large console bin that included two sliding cupholders, and there was a smaller forward-console bin conveniently placed under Aux/2 USB/12-volt plugs. In addition, there were side pockets on the console and huge map pockets in the doors with two cupholders each. 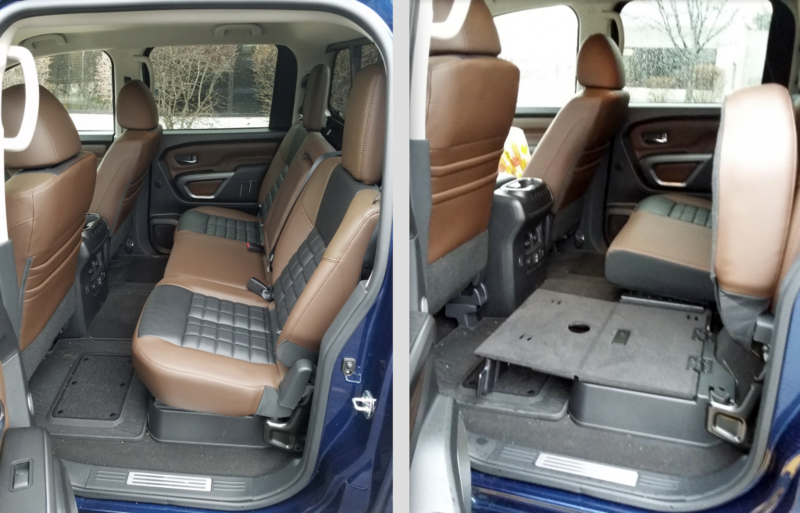 In back, the rear seat cushion could be raised to reveal hidden storage bins and a fold-out platform, and there were map pockets with cupholders in the doors. Follow the arrows. 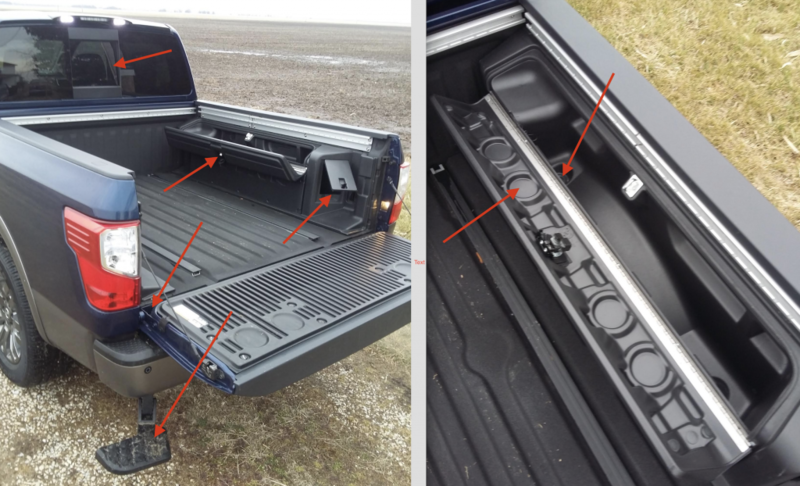 Left, starting from top: sliding rear window, locking bedside storage bins, handy corner bins with flip-up covers, cushioned tailgate, fold-down step. Right: Side bins contain two drain plugs in their floors, and the bin lids include numerous built-in cupholders. The cargo bed didn’t disappoint, either. There was a sliding back window for carrying long items, large locking boxes over the wheelwells with non-locking rear corner bins, a pull-down step under the rear bumper to help gain access to it all, and a cushioned tailgate. 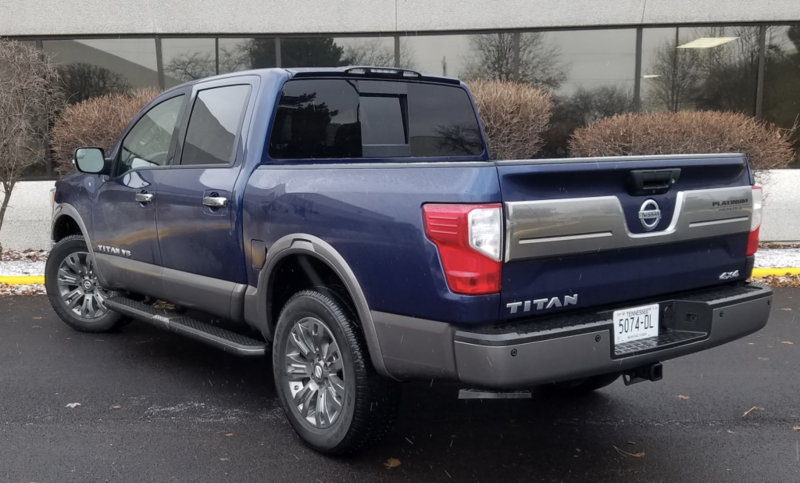 While others in the class can boast of more high-tech hardware, the 2010 Nissan Titan’s “low tech” approach actually works quite well. It’s too bad most buyers in the segment will discount it simply because it doesn’t carry a domestic badge — especially since it’s built right here in Mississippi. 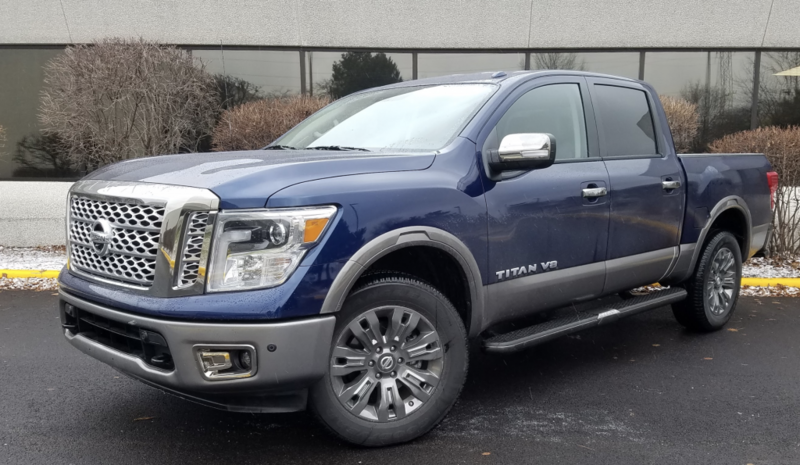 Many will ignore it simply because it doesn’t carry an American “brand,” but Nissan’s Titan really lacks little compared to other members in its class. Written by: The Daily Drive staff on January 21, 2019.on February 22, 2019.